Close up of one of the light Tartar units. I have 3x10 light cavalry and 1x16 heavy cavalry units painted so far. I don't think I really need any more unless I decide to do a specific Tartar army. The 'Husaria' rules produced by Ian Wilson has excellent army lists for the period 1580-1680 and include at least 3 seperate Tartar lists. I have yet to play these rules but they look fun and I was fortunate enought to see a demo game put on by Ian and friends on the show circuit in the UK in 1999 (please more photos Ian). The game was Zbarazh 1648 and was shown in all its glory in Wargames Ilustrated (Feb. 200, no. 149). I blame Ian for my intense interest in the last 18 months, as the game, colour and history had a great impact upon me but did not come to fruition until I came back to Australia 2 years ago after 2 years in Norway studying. Our group played Zbarazh just over a year ago and one of our group (Robert Fletcher) even built a nice wooden fortress for the game. I must say that it was a great and fun game with the Poles trying to rescue their brethren from the besieged fortress, they had to fight through hordes of Cossacks and Tartars. 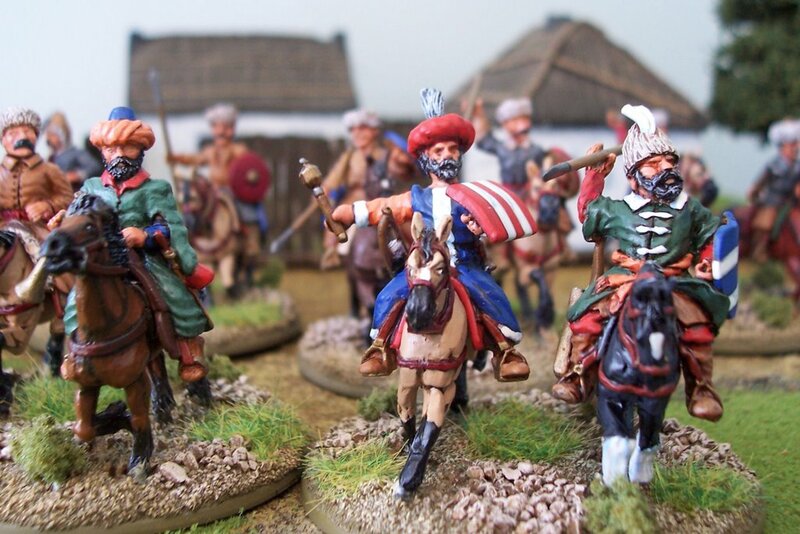 I have painted more Cossack and Tartar cavalry since so we should give it another go.